Song is twittering musical trill. 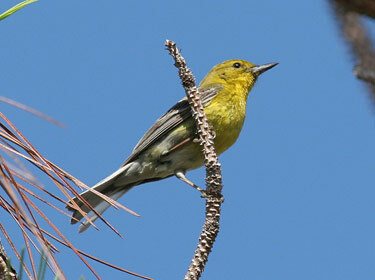 Description: Unstreaked olive-green upperparts; blackish wings with two white wing bars; relatively large bill; short undertail coverts make tail look long; dark cheek patch. 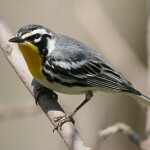 Male has yellow throat and breast; dark streaking on sides; white belly and undertail coverts. Female is duller. Behavior: Deliberately creeps while foraging over trunks and branches. 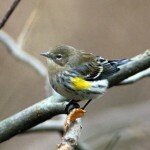 Habitat: Migrants are found in a wide variety of forests, especially pine forests. Also occurs in deciduous forests and orchards. 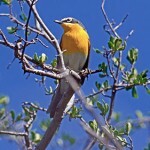 Where in Nebraska: Rare migrant in eastern Nebraska. No records farther west than Antelope County. Most of records are from Lancaster County.